by Dai Junfu, France’s representative at the 2016 World Amateur Go Championships (WAGC). It is a strange and very bitter feeling. I finished in 9th place at the 37th WAGC, a very disappointing result. Before the tournament, many people close to me said that I had the level to take 3rd place, and with luck, that I could finish even higher on the podium. Even myself, I had the same illusion, because Satoshi Hiraoka, the representative of Japan and twice winner of the WAGC, had been defeated by players from Europe, but I had never lost against a European. In the end, my sense of pride and lack of practice cost me dearly. I had quite a difficult draw, because at the end I had the third highest SOS despite my three defeats. Starting from the third round, my opponents where all higher than 6-dan, excepting the final round. After having beaten the USA’s Benjamin Lockhart (7-dan), I was drawn against the winner of the tournament, China’s Bai Baoxiang, in the 4th round. 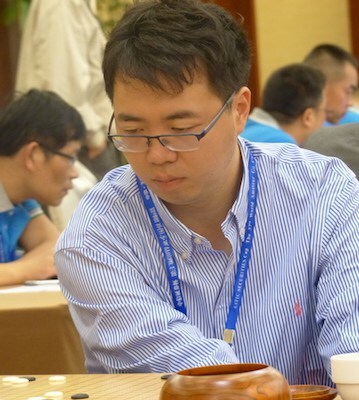 He is considered to be one of four titans of amateur go in China, and his level is at least 4 or 5 professional dan. He turned down many chances to become a professional because he makes a good living from the many amateur tournament in China which have high prize pools. I tried with everything, but he had a solid victory without leaving me the slightest chance. It was the first time in 10 years that I had the feeling of losing a game without creating any problems for my opponent. Very sad. For the 5th round, my opponent was the player from Hong Kong (6-dan). He took a lot of territory but was unable to resist my attacks. With 4 wins from 5, I regained my confidence and was on track for a podium finish. The turning point came in the 6th round. After losing to Taiwan, Japan’s Satoshi was without any significant victory. I was convinced that I was bound to defeat him, and that he would undoubtably make some blunder and I would have an easy win. In the game, my play was completely unbalanced. I could not recognise myself. I started to wake up when he had almost enclosed his gigantic moyo. Despite my tesuji in his centre, contrary to my illusions, he responded well and I was lost. Later, Mr Satoshi lost by not more that 2.5 points against Bai Baoxing because of bad yose. Actually, he is very strong. If I had appreciated his level, then I would have played differently against him in my game! After this defeat, I had said goodbye to the podium. Round 7, is the game against my old friend Cristian Pop (7-dan) from Romania. Cristian made his usual moyo but I brought the game under my control. Then, at the crucial junction, I played the losing move, an instinctive play without a second of reflexion. Cristian took advantage of a ko and a good threat to take back control of the game. The last round was against a Belgian player and I won easily. Thanks to my high SOS, I took the 9th place but it was really a mediocre result and I felt a little ashamed. After the championship, I had the impression that the level of amateur players had progressed globally. The European players also had very good results. Notably the Ukrainian Andrii Kravets took 4th place ahead of Japan. Even if it was a disappointing tournament for me, I met many new friends from all around the world. Notably I established a good relationship with the administration of the IGF. I hope that I can contribute more to the development of Go in the world because of my ability with languages (Chinese, French, English and a little Japanese). I hope that I can train a little more so as not to drop down in level, and I hope to make a better result if I am able to represent France again. Based on the original report in Revue Francaise de Go, which includes game records and pictures.